Listening to Cookin’ On 3 Burners is like poking your head through a time portal that stretches between the year you were born and the middle of next week. On one hand there are clues to a spiritual home that’s situated somewhere in the back streets of 1966, but on the other is a reinvented soul stew that’s very much a product of the 21st Century. 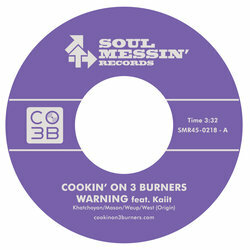 Formed in 1997, Cookin’ On 3 Burners was always meant to be an experiment in sound. Drenched in the bluesy soulful influence of the late 60′s/early 70′s output of labels such as Prestige, Bluenote & Groove Merchant, these Melbourne music stalwarts began serving up a feast of tasty funk on a bed of Hammond soul, creating a flavour that gets better with every lick of the spoon. With many releases over the years, In 2017 Cookin’ On 3 Burners collaborated with UK based artist Emmi and released remixed material on the Warner Music label with producers Lenno, Niklas Ibach, Funk LeBlanc, Yolanda Be Cool and more. Extensive touring throughout Europe and the UK rounded out the busy year. 2018 and in their 21st year, Cookin’ On 3 Burners will be dropping a new album. 'Warning’ is the lead single from CO3B's forthcoming album Lab Experiments Vol. 2, and was co-written with PNG-born and Melbourne based vocalist and songwriter Kaiit. With honeyed vocals, fierce rhymes and a bold eclectic style to match, 19-year-old Kaiit is alluring audiences to her sweet sound of soul. Kaiit is running things on this punchy, hard-hitting vocal banger.